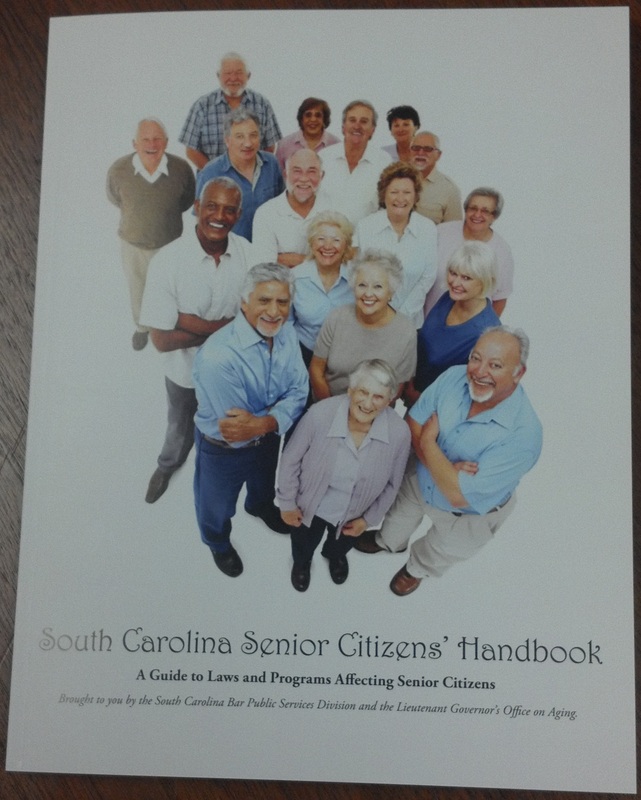 The South Carolina Bar Public Services Division and the Lieutenant Governor’s Office on Aging recently collaborated together with members of the South Carolina Bar Elder Law Committee to update the SOUTH CAROLINA SENIOR CITIZENS’ HANDBOOK: A Guide to Laws and Programs Affecting Senior Citizens. This project was funded by a grant from the Administration on Aging. This is a FREE resource and is now available online at http://www.scbar.org/LinkClick.aspx?fileticket=QL4xW3AqA8Q%3d&tabid=204. The print versions should start arriving in local South Carolina libraries soon. And an entire portion is devoted to a Community Resource Directory. Even if you’re not yet a Senior or caregiver, you may want to look into some of these sections. The information is really helpful and easily accessible. Plus, it’s never too early to start planning. If so, there may be help for you via SC HELP, see SC HELP Flyer. South Carolina has been awarded, $295,431,000 in funding from the U.S. Treasury Department’s Hardest Hit Funds to prevent mortgage foreclosure. SC Housing Corp., a non-profit Division of the South Carolina State Housing Finance and Development Authority is administering the Program, known in SC as the South Carolina Homeownership and Employment Lending Program or SC HELP. South Carolina Legal Services (SCLS) is one of the housing processing agencies for SC HELP. SCLS assists homeowners who are at risk of foreclosure gather and submit the required documents to be approved for mortgage assistance through SC HELP. There are no income requirements for SC HELP and all services are free to the homeowner. SC HELP will not pay any more than $20,000 on the arrearages. SC HELP may approve payment of the $20,000 but the actual payment will not be made until SC HELP has verification that the homeowner can pay the balance of the arrearages or that it has been forgiven by the lender or it has been placed at the end of the mortgage. The requirements for the property disposition assistance program should be carefully reviewed. NOTE: A homeowner is not eligible for this program if the property has already been sold at foreclosure. Recently I had a moment to sit down with a law school classmate, Margaret S. Day aka Molly and discuss pro bono and public interest law with her. I understand that you were active with pro bono in law school. Please tell me about your experiences there. I was very fortunate to become involved with Women in Law and the Pro Bono Board in law school, and those two entities opened up a world of volunteering for me. I participated in Sistercare‘s Battered Incarcerated Women‘s project, which allowed me to assist women in correctional facilities with their legal proceeding against their former abusers. Going to the correctional facilities and meeting these women from all walks of life who had harmed their abusers and then been punished for that was a real eye opening experience. I learned a lot about appellate proceedings and a lot about life from that experience. I also volunteered with Sistercare’s legal advocacy project at the courthouse. I sat in Sistercare’s office a few hours a week and helped battered women fill out temporary restraining orders and other documents to protect them against their abusers. I also went to court as moral support for some of these women who were facing their abusers. Again, I learned a lot about the legal process and life with this project. In law school, I was privileged to serve as President of the Women in Law Association. I took part in the organization of many fundraisers, such as the Race Judicata, a race to raise money for a local charity, and a large garage sale in the lobby of the law school, among others. I learned so much about fundraising from the ground up with these endeavors, and I use this experience today on every nonprofit board I serve. What first drew you to pro bono work? I was drawn to become a lawyer and especially to pro bono work when I was in undergrad. To work my way through undergrad, I worked in a casino in Tunica, Mississippi, what was, and may still be, the poorest county in the United States. To get to work, I would have to drive by ramshackle shacks built on mud and built of plywood, with no plumbing, and naked children. Prior to that job, I had not been exposed to poverty at that level. These same residents would come to the casino and spend their welfare checks at the slot machines. Compared to these people, I was wealthy with my casino salary and tips. I so wanted to help, but had no idea where to start. It was when the casinos were fighting unionization that I learned I might be able to persduade with argument. I was asked by the cocktail waitresses to be a spokeperson for their interests. The ensuing discussions opened my eyes to the law as a career possibility and way to help people. Please tell me about your current pro bono work. Currently I spend most of my pro bono work helping LowCountry Legal Aid, a nonprofit organization that provides legal services to those who could not otherwise afford it. The majority of the cases we see are family law related. This cause is so important and some people don’t understand it. Can you imagine being married to an abuser of you or your children and not being able to get a divorce? My work with LCLA has certainly influenced my pro bono work. I am more willing to take family law cases even if it is an area that I have never practiced in before. The need is so great, and I am willing to ask other lawyers with experience to assist me and bring me up to speed, just so a person will have a lawyer. Keeping a nonprofit going in this economy is a full time job, especially a nonprofit that is little understood by those outside of the legal field. I serve on the Board for LCLA, and as its Community Outreach Coordinator, two roles that could easily fill a full time schedule. I also assist in setting up wills clinics for groups in the community. We recently did a wills clinic for the Bluffton Fire Department, and we hope to do another one soon for another service or community profession. I am also a PAI (private attorney involvement) for South Carolina Legal Services. I take cases at a reduced rate for people that could not otherwise afford an attorney. Right now I am representing a man that is trying to adopt his nephew. I am learning a lot about adoption! Luckily I have a friend from law school that does adoptions all the time, and she has provided immeasureable advice. How do you find out about this work? I usually find out about pro bono projects through friends. Robin Wheeler (you!) introduced me to the SC Legal Services people at a Bar Convention. My friend Mary Sharp, a lawyer in private practice, introduced me to Lowcountry Legal Aid and asked me to be on the Board while she was its president. My friend Pam Robinson of USC Law school has opened my eyes to many pro bono opportunities. Additionally, I have nonlawyer friends that ask me to help at events. I wish that I had the time to do more pro bono work for LCLA. I would like to start taking cases for them in estate planning and advance directives. I never anticipated that there might be a need for these areas for people that need legal services, but I have found that all people need to feel secure about the guardian of their children should they pass, or the person making their healthcare or end of life decisions. I am hoping that I will soon be able to devote a set time every week to assisting LCLA with this area. What other projects have you done? I would like to talk about my appointed cases. I have been appointed to represent some men in my past three cases that were accused of very nefarious activities. I was appointed to represent a man that spoke no English and was accused of shaking his baby, and his baby was taken away from him. He was a decent man and a good father, but because he did not speak any English and was lower income, his baby had not been diagnosed with a rare brain problem she had since birth. A small fall on to the floor produced symptoms of shaken baby. It was very rewarding to prove that he was a good father and get his baby back into the home. This case could have fallen through the cracks and the baby could have entered the system. Luckily, that did not happen. Another appointed case I had was a father accused of sexually molesting his child. He had not molested her and in fact had not been allowed to see her for two years. He had a disability and was not the most educated person, so he had been pushed through the DSS system without understanding the ramifications. Indeed, he had been paying child support on a child that he averred was not his for two years. After almost a year of hearings and arguments, he was allowed to stop paying child support for the child that was not his, and have visitation for the child that was. In cases like these, the appointed attorney is often the only fail safe the client has to see that justice is done. In these difficult economic times, the judicial system and the state agencies are so overburdened and understaffed that they cannot possibly investigate all of the facts and make sure all parties are represented to the utmost. The appointed attorney must give those cilents 100%. What have you learned by doing pro bono? I have learned so much about humanity, good and bad, and been surprised by who was good and who was bad. And i have learned so much about the law that I would not otherwise have learned. I have met the most interesting people while doing pro bono work; people I would not have met otherwise, if i had not ventured out to do a pro bono project. My pro bono clients have been so grateful for my representation, and it has always been a rewarding experience to represent them. I have gained a new respect for the American justice system. Many times the pro bono lawyer is the one last stopgap for the client in an overburdened legal system or state agency system. In many of these cases the person has not been heard in his or her steps through the system and the pro bono lawyer is the first person to listen to the person and validate them. Has this changed your view of law or pro bono service? My view of the law has been changed by my pro bono service. My first job out of law school was working for a government agency, and my next job was working for a big firm. In both jobs, I was able to get a routine down to do the most work efficiently to make the most money and produce the best results for my clients. But in both jobs, my clients were big entities and it was easy to lose sight of the real purpose of the legal system. With my pro bono work, I have represented individuals who must rely on the justice system to decide the biggest things in their life. I have gained a renewed respect for due process and our judiciary in this process. What do want to tell lawyers or law students about pro bono? Just do it! Not only will you learn some legal skills, get your name out there, and meet new people, but you will make the world a better place for some lucky client. Seeking Comments from South Carolina Attorneys! The South Carolina Bar Pro Bono Committee and the South Carolina Supreme Court Access to Justice (SCATJ) Commission are seeking input on proposed changes to Rule 6.1 of the Rules of Professional Conduct (SCACR 407). This rule concerns the provision of pro bono service to individuals of limited means or public service/charitable organizations. The proposed changes include the creation of a reporting mechanism for pro bono hours and a requirement that those hours be reported to the Bar. Pro bono participation remains voluntary. Click here to view the proposed changes to the rule. Should Rule 6.1 be amended in the future, the Bar would provide additional information to facilitate the reporting. Please send comments on the proposed changes to Cindy Coker, Public Services Director or Stuart Andrews, Vice- Chair of the SCATJ Commission. Comments should be received no later than Friday, November 5. Today is the last day to register for an exciting event in Charleston on Thursday, September 23rd. For attorneys, this is a great opportunity to attend a Continuing Legal Education Event to learn about the Americans with Disabilities Act (ADA) and its impact over the past 20 years. 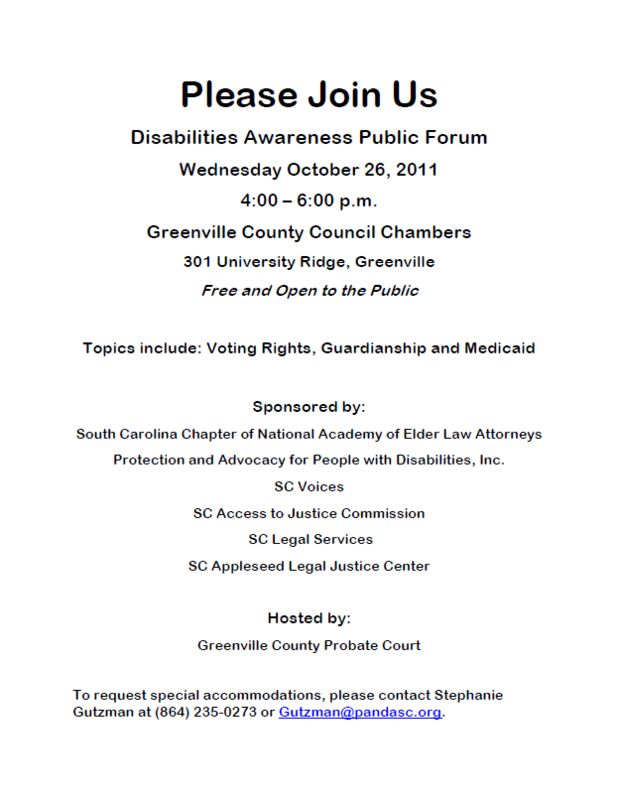 The ADA and Medicaid Issues: Georgia’s Experience – Joshua Norris, Georgia Advocacy Office, Inc.
For the public, this event offers a special evening of celebration and a chance to meet some passionate disability advocates with a presentation by Samuel Bagenstos. And the reception is free. Registration is required however. Both these events offer a wonderful opportunity to celebrate 20 years of the ADA! Please join us in the celebration! For more information, please visit http://www.pandasc.org/. It’s BACK TO SCHOOL time and not just for kids! 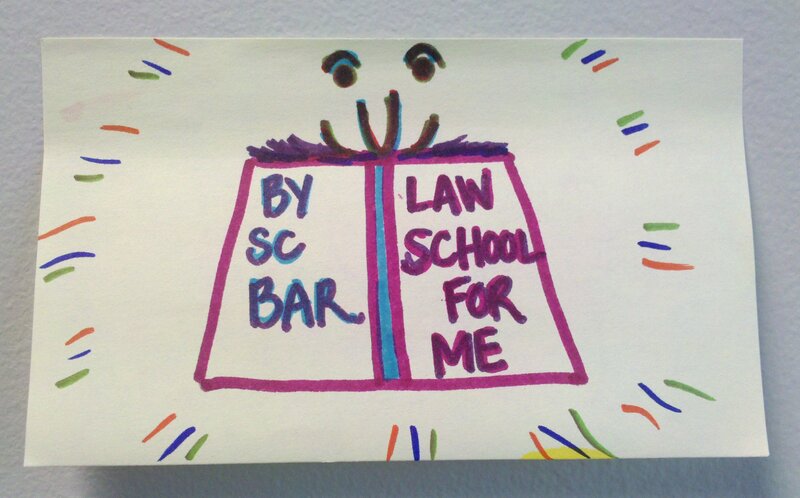 You can go back to school too, via the SC Bar’s Law School for Non-Lawyers course. The program is a 7-week Law School for Non-Lawyers course covering a variety of general legal subjects. The registration fee is $45 which includes course materials. Offered every Tuesdays from 6:00 p.m. to 9:00 p.m.
Every Monday from 6:00 p.m. to 9:00 p.m.
For any other questions or concerns you have, please contact Debbie Morris at dmorris@scbar.org or 800-395-3425, ext. 158. The Law School for Non-Lawyers is made possible through an IOLTA grant from the SC Bar Foundation.